National Tree Planting Day in Tanzania is celebrated on April 1. The campaign was launched in 1999 in order to fight deforestation and contain the encroachment of desert. Tanzania is a highly biodiverse country with a wide variate of habitats. Approximately 38% of its land area is set aside in national parks, reserves, and other protected areas for conservation. Prevention of forest loss is an important aspect of Tanzania's conservation policy. Forest land constitutes abut two thirds of Tanzania, but the country has been losing its forests over the past years. 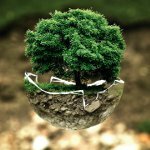 National Tree Planting Day was launched in 1999 to raise awareness of deforestation and consolidate efforts to fight it. Originally it was celebrated on January 1, but in the 2010s its date was moved to April 1. National Tree Planting Day is mostly symbolic as rain season varies with region, and each region has its own planting season. On April 1, the Tanzania Forest Services Agency holds special events, for example, launching of new forest plantations. Numerous events are also held at Tanzanian schools. They aim at educating Tanzanians on the benefits of planting trees and the proper ways of doing it as well as raising awareness of the dangers of deforestation.